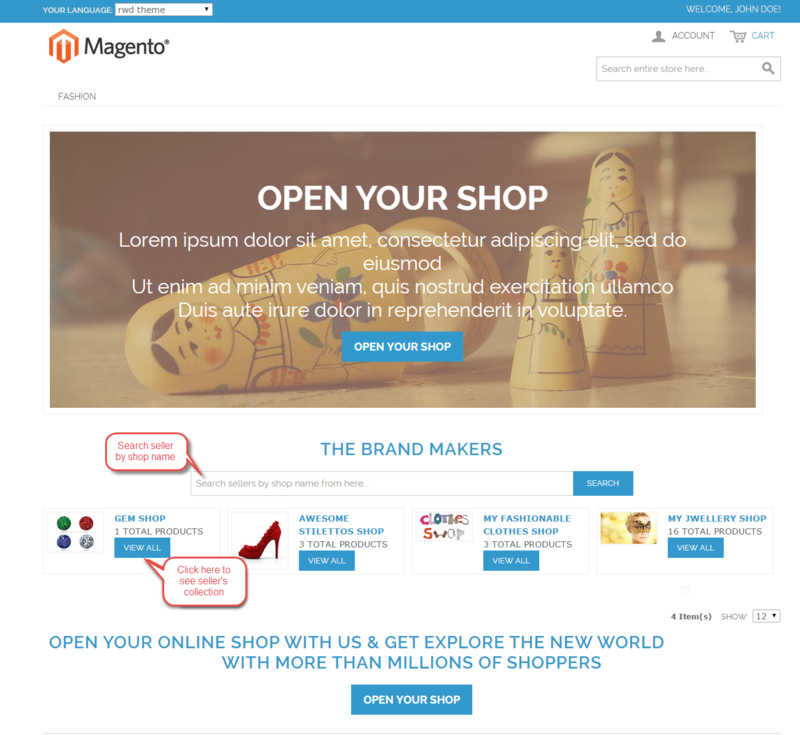 Magento Multi-Seller Marketplace Extension converts your Magento Store into a complete online marketplace shop. Using Magento Marketplace Module, the seller can manage their Products, Order Shipment, Split Payment, Returns and every standard marketplace features (using add-ons for marketplace). 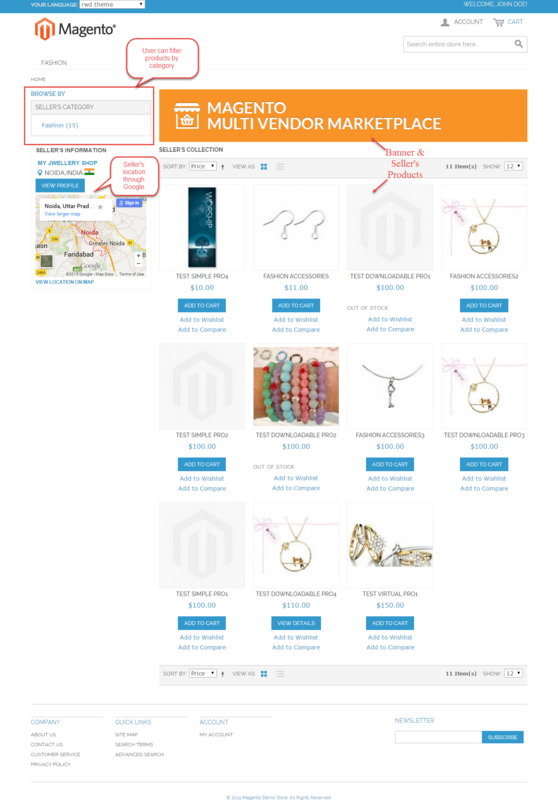 The current version of Magento multi-vendor module works in the Responsive theme which is very convenient for users. 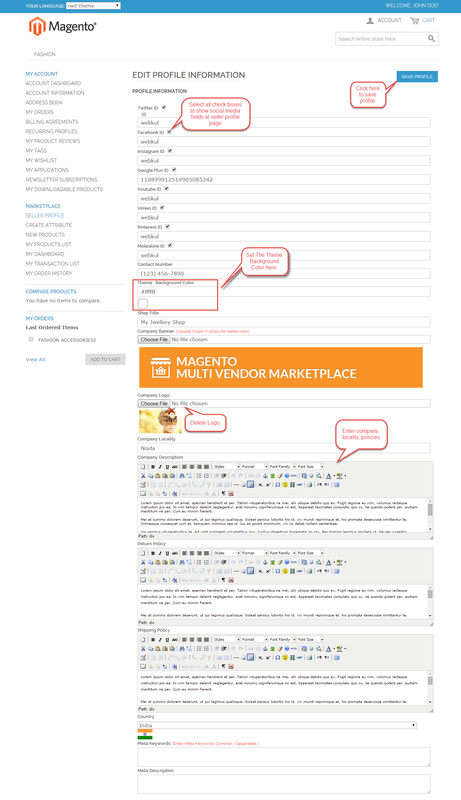 Magento multi-vendor module works very fine in a community ( free ) and enterprise version of Magento. Marketplace extension works very fine with all languages (including LTR and RTL ). Marketplace module has multilingual support. Marketplace Support all templates and themes including latest RWD, Ultimo (responsive web design). Mobikul Marketplace (A Marketplace Mobile App)– Our marketplace mobile app has been launched. 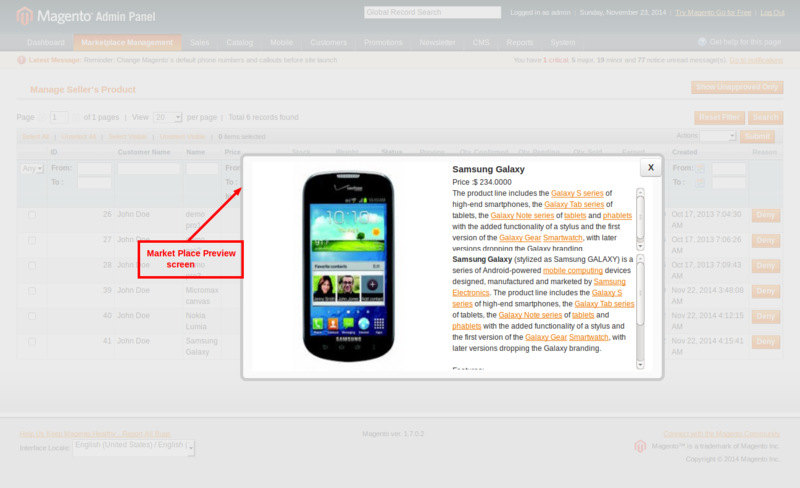 Mobikul Marketplace converts your Magento marketplace store into a mobile app. Now customers can easily purchase products on the go. They don’t need to have a laptop or desktop, they can easily explore your store through their smart phones.The sellers can see their dashboard, order history and can contact to the admin through the mobile app. So what are you waiting for, you must now have a mobikul marketplace to be a step ahead. To enhance the capability of marketplace module, we have created many add-ons for marketplace module. Any buyer can become a seller and can sell their products on Marketplace. A special and attractive design to manage the Products, Sellers, and Commission. Admin can assign or unassign product to any particular Seller. Buyer can give their reviews about sellers.This module provides an attractive landing page with top 4 sellers with their top 3 products. Allow the seller to edit shop URL for the Profile page, collection page, review page, Location page. Ajax check for vendor/seller shop URL. Work with all the themes and templates including responsive templates. Separate seller’s product collection page. The seller can manage the order from the front-end. Allow seller to create a duplicate product from seller panel. 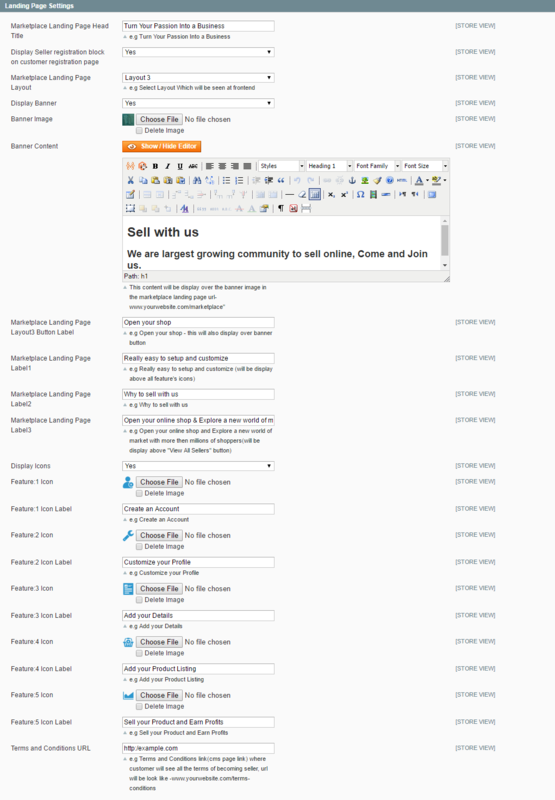 Marketplace sell page (in the case of layout 2 and layout 3) works as seller central where the user can separately create his account. 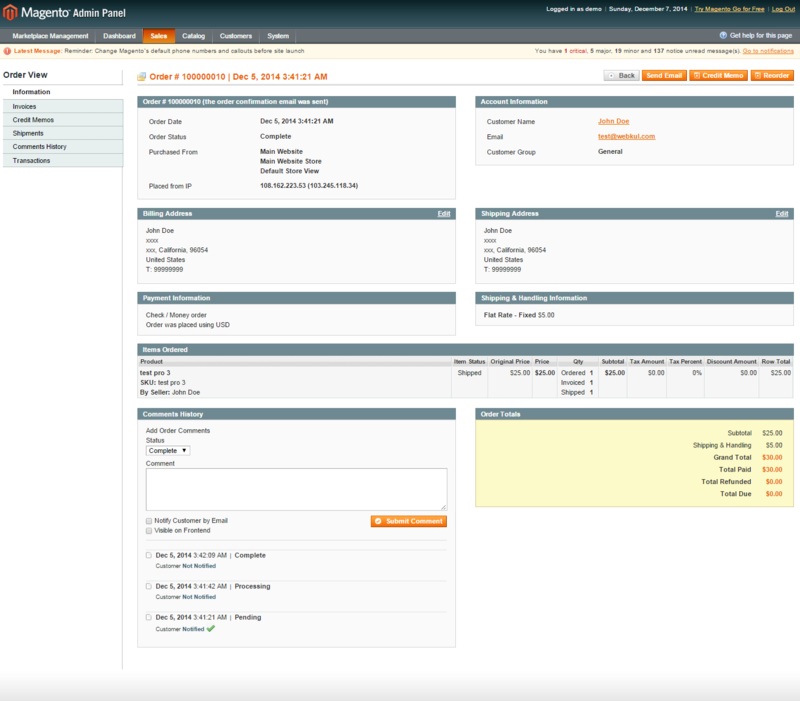 Admin can allow the seller to add related products, up-sell products and cross-sell products from seller’s panel. 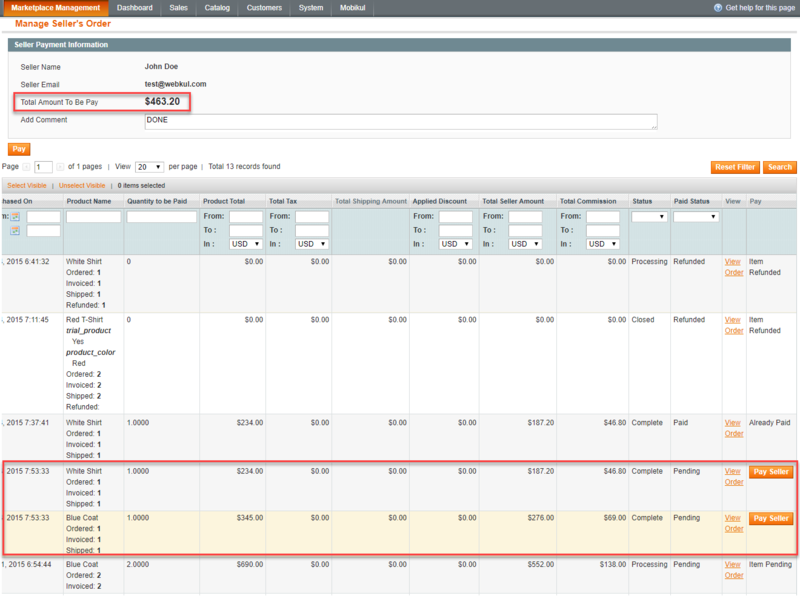 Admin can allow the seller to add product limit for the customer on product purchase. Multi-lingual support, all language working including RTL (http://en.wikipedia.org/wiki/Right-to-left Hebrew and Arabic). Installation of the marketplace module is super simple after downloading the marketplace module from this URL. After downloading the Marketplace zip file, you need to unzip it on your system. You will find two folders inside it namely- MagentoMarketplace and MagentoMarketplaceUltimoThemePatch. Inside the MagentoMarketplace file folder you will find SRC folder, inside the src folder you will find app, media & skin folders. 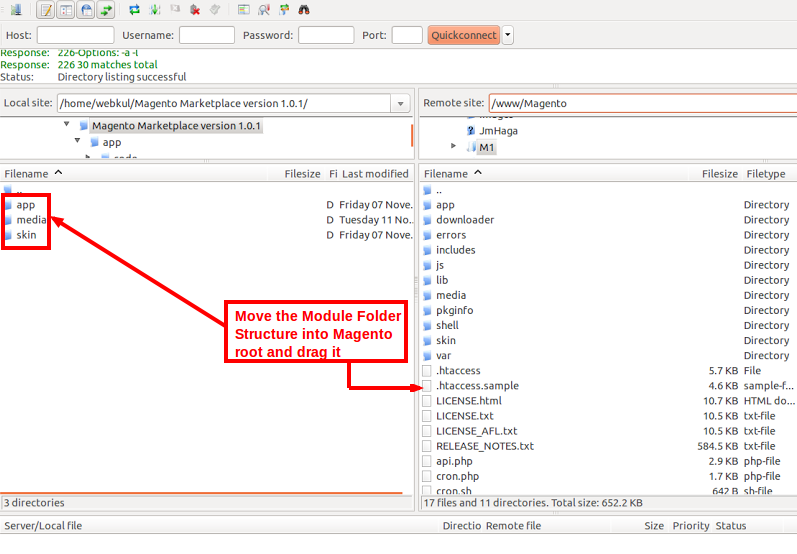 You have to upload these three folders- app, media & skin into the Magento root folder on the server as shown below. After uploading the app, media & skin folders into the Magento root folder as shown above, if you are using a custom theme like Ultimo, for which we are already providing the Ultimo theme patch for Marketplace you need to navigate to MagentoMarketplaceUltimoThemePatch->src->app and upload the app folder into the Magento root folder as shown below. 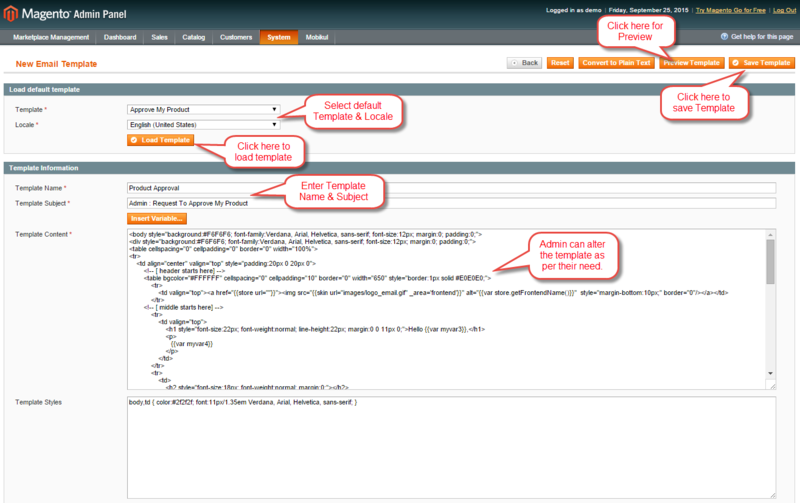 After moving both the folder flush the cache from Magento admin module. Under System > Cache management. Inside folder Magento Marketplace->src->app->locale-> we have two folders en_US and es_ES. If you want to change the language to Spanish, then just move your Webkul_Marketplace.csv which is inside the es_ES folder file inside the Magento root -> app/locale/[LANG CODE]. For an example, if you want to change the language in Spanish, then choose the locale Spanish and put the locale Spanish and put the Webkul_Marketplace.CSV file inside inside app/locale/ as shown below in the screenshot. After Magento marketplace module installation, unzip the folder and click on the src folder, inside src folder you have an app folder. Click it to open the locale folder, inside the locale folder you shall have the language folder. e.g en_US. Inside this folder, you have Webkul_Marketplace.csv file, open and edit it according to the translation. 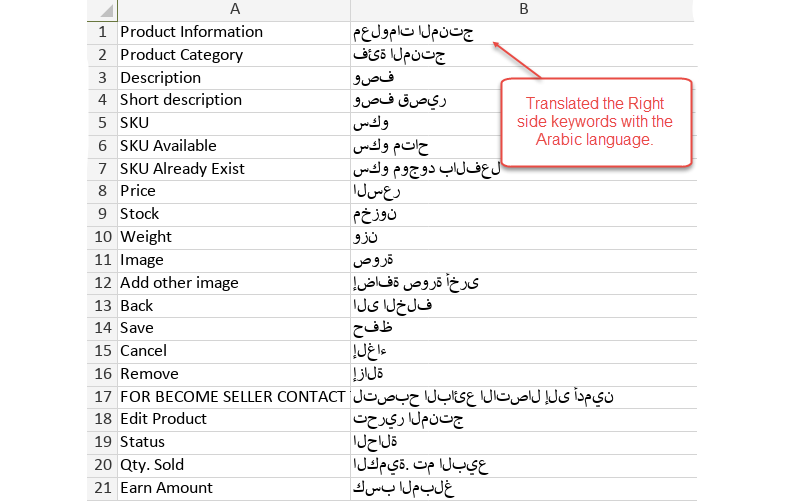 Now you need to translate all the keywords on the right hand side inside the Webkul_Marketplace.csv file as per the below screen shot. 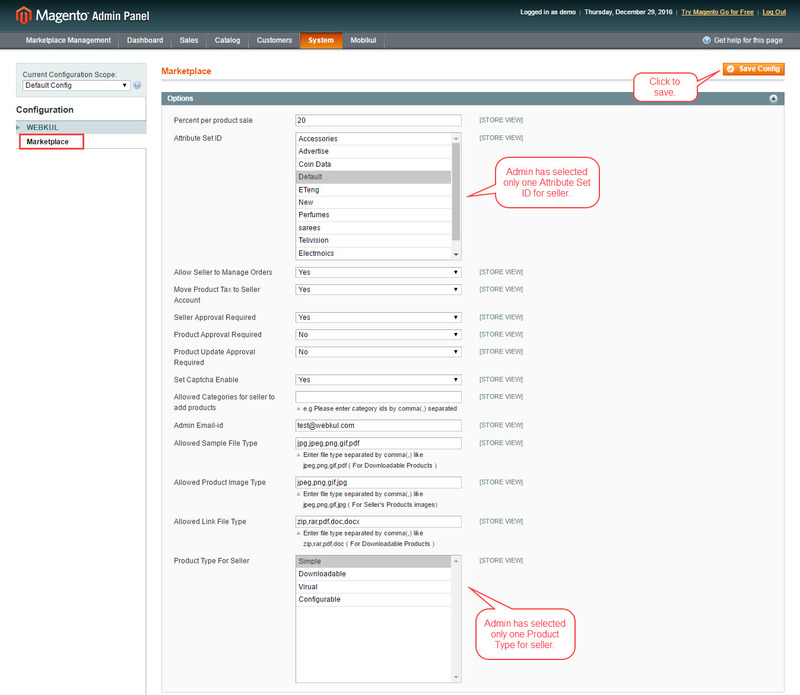 Follow the same path inside the Magento root on the server and open the locale folder where you have installed Magento Marketplace. Now create a new language folder with the language code ar_SA, the language in which you want the translation. Now, upload the translated Webkul_Marketplace.csv file from the step 1 to the language folder inside locale on the server. 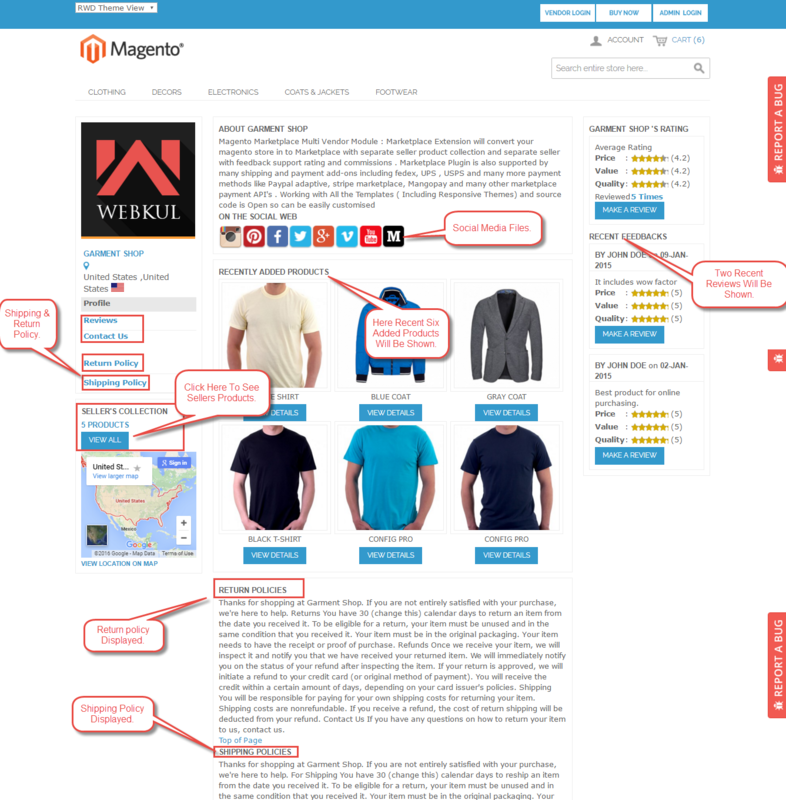 Now you are done translating your Magento Marketplace Multi-Vendor module. 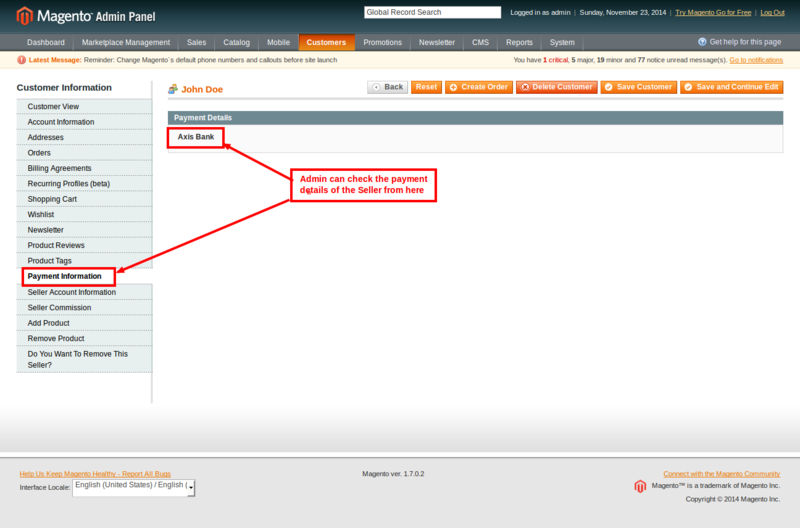 After the successful installation of the marketplace module, the admin can configure this module. The admin will be able to see Marketplace Configuration settings by navigating through System>Configuration. 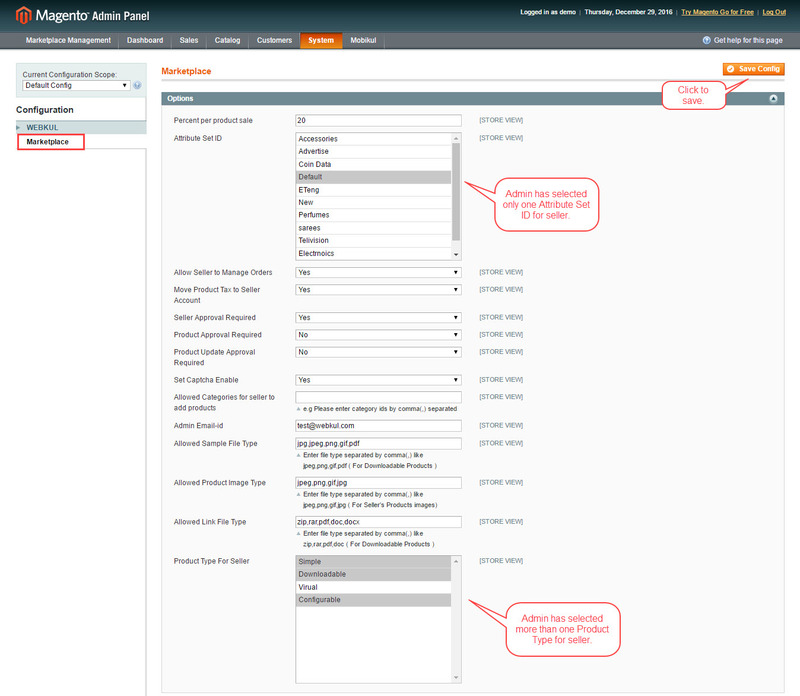 As per the above screenshot, you can see many admin configuration parameters for Marketplace. Let’s explain one by one. Percent per product sale is the global commission which the admin needs to enter. This commission mechanism will be applicable for all the sellers. Let’s say as an example there is a seller S1 and his/her product(P1) price is 100 USD so on the sale of product P1 seller will get 80 USD and admin will get 20 USD as commission. Attribute Set ID is the default ID for your global catalog. Admin can select multiple attributes set from the Multi-Select list. 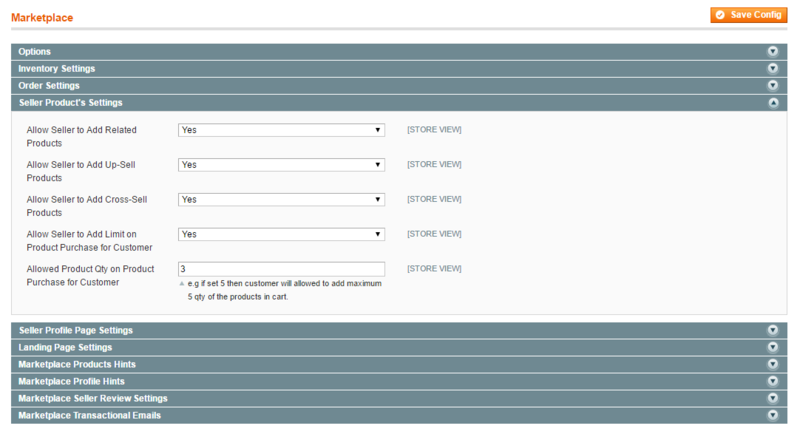 By enabling “YES”, the admin allows the sellers to manage the orders from front-end. 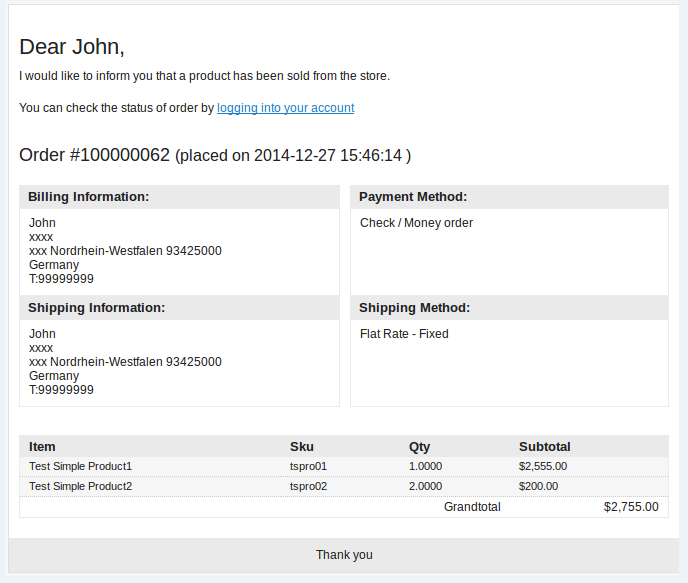 Now the seller can generate invoices, tracking number and shipment for the orders of their products. Even the seller can notify the customers by sending them emails, cancel/refund the order and even print the order. And by enabling “NO”, the sellers can’t manage the orders for their products. 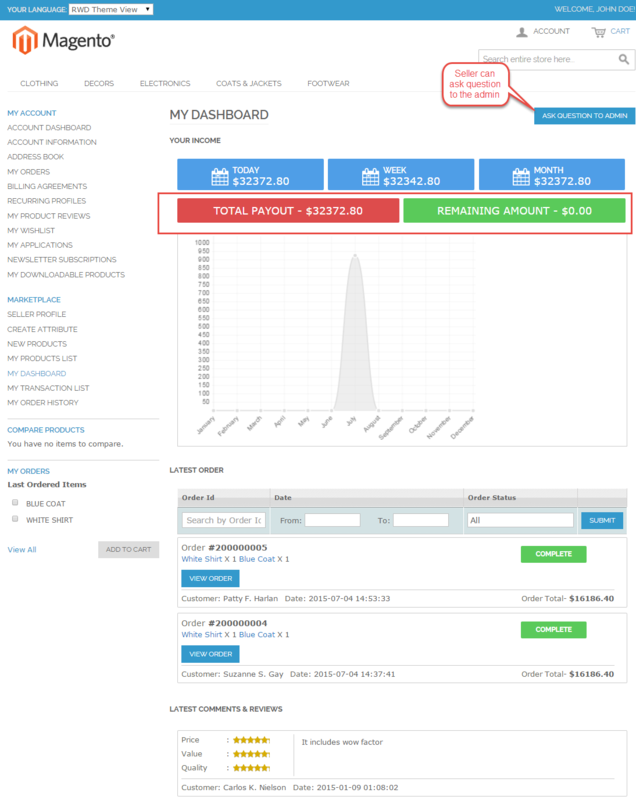 Now the admin will generate invoices, tracking number and shipment for all the orders. If Move Product Tax To Seller Account is set as NO then the product Tax amount will forward into Admin account else, it will go into Seller account. If the admin has set “Seller Approval Required” as “Yes”. Then, the users required the admin approval to become the sellers. 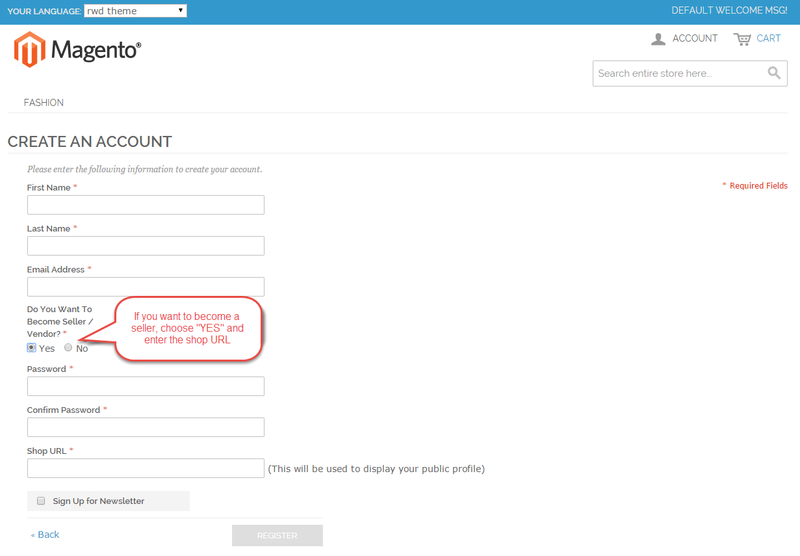 But if this option set as “No” then the users won’t require admin’s approval for becoming the sellers. If the admin has set “Product Approval Required” as “Yes”. Then, Whenever the seller adds products, he would require admin’s approval to make the product visible on the web store. But if this option set as “No” then the sellers won’t require admin’s approval for their products. The admin can Enable/Disable the captcha from the backend. Captcha is used at the time of contacting a seller as shown below in the screenshot. 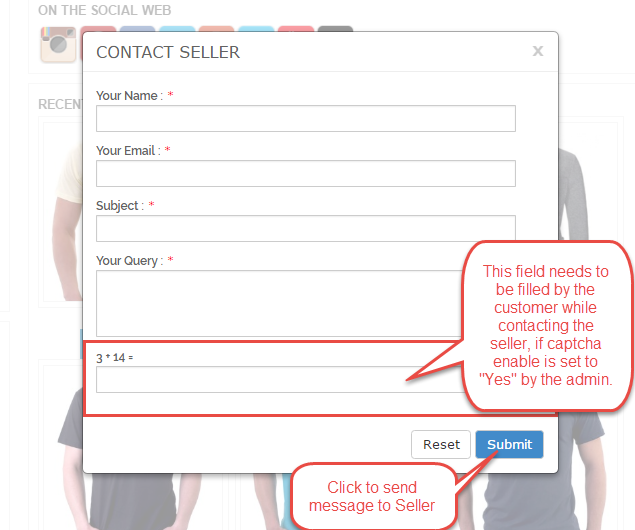 After clicking on “Contact Us” option, this pop up comes up where the buyer needs to fill in the required information and the captcha to send the message to the seller as shown below. By this option, admin can restrict Product update by the seller. If the admin has set “Product Update Approval Required” as “Yes”. Then, whenever the seller tries to update any parameter of the product, he would require admin’s approval to make those updations visible on the web store. Else if set as “No”, then no need of admin’s approval. Using this field admin can restrict seller to use only some selected categories to add products. Those categories which are not selected by admin will not appear. Here, the admin will enter the “file extension” of the image for the product and these extensions will be comma separated. While adding new products the seller can add images of the products having the extension configured by the admin from the backend. Enable Low Notification– If “Enable Low Notification” is selected as “Yes”, then seller get notified via emails when their product inventory decreases with subsequent orders. As soon as the inventory reaches to the specified minimum level set by the admin, a low stock notification mail will be sent to the seller if enabled from the admin panel. Low Stock Quantity– Enter low stock quantity, which will allow sending low stock notification mail to sellers when product quantity will be equal or less than this quantity. When “Order Approval Required” is set as ‘Yes’, the admin has to approve each order manually and only after that seller will get notified about the order. If set as ‘No’, order notification will automatically be sent to the seller. 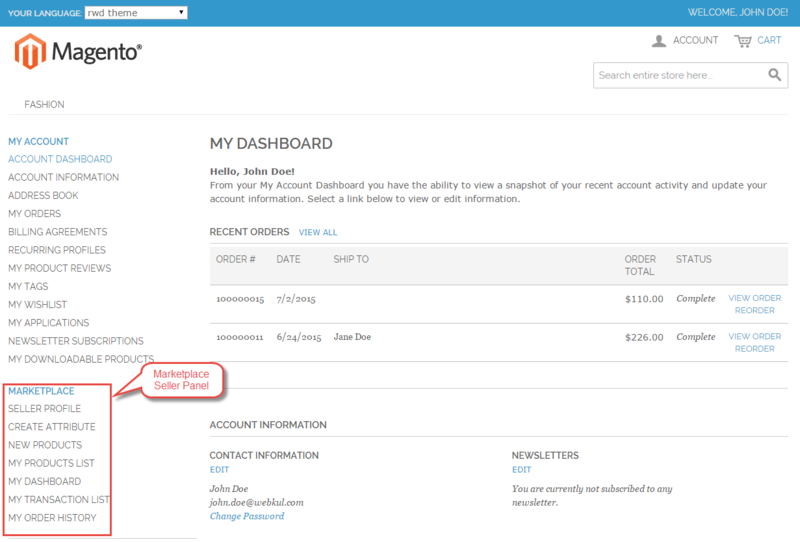 Admin can approve an order by navigating to Sales > Orders. Once the order gets approved by the admin, the seller will receive a notification email and can manage or view the order from his seller’s panel. 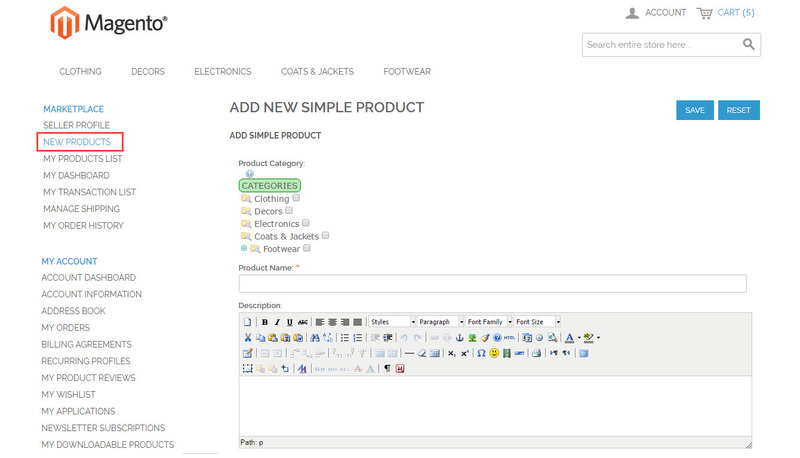 Admin can allow sellers to add ‘Related Products’ while creating or editing products from the seller’s panel. 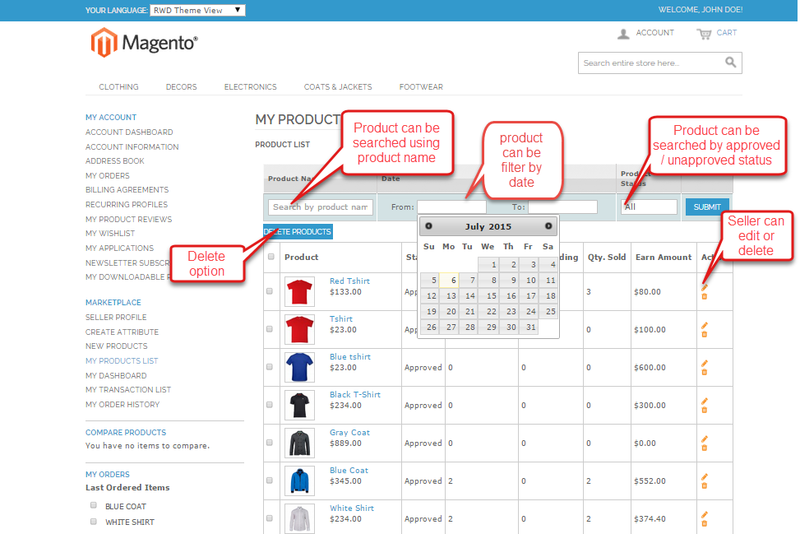 Admin can allow sellers to add ‘Up-Sell Products’ while creating or editing products from the seller’s panel. 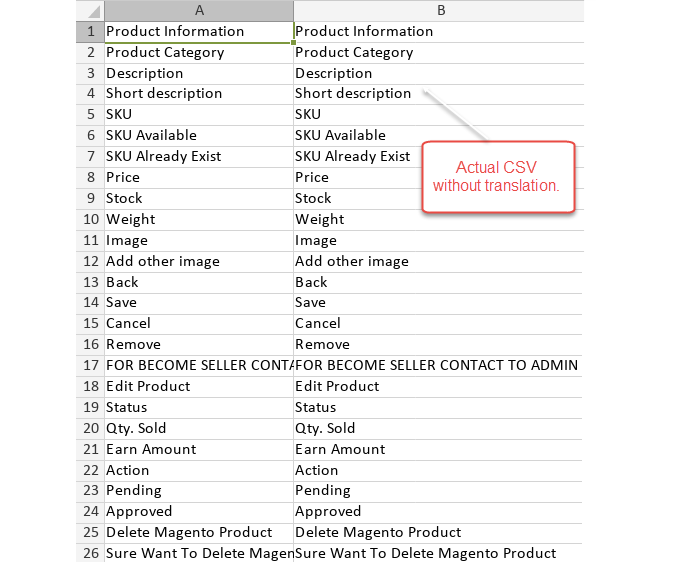 Admin can allow sellers to add ‘Cross-Sell Products’ while creating or editing products from the seller’s panel. Admin can allow the seller to set product purchase quantity limit for buyers. 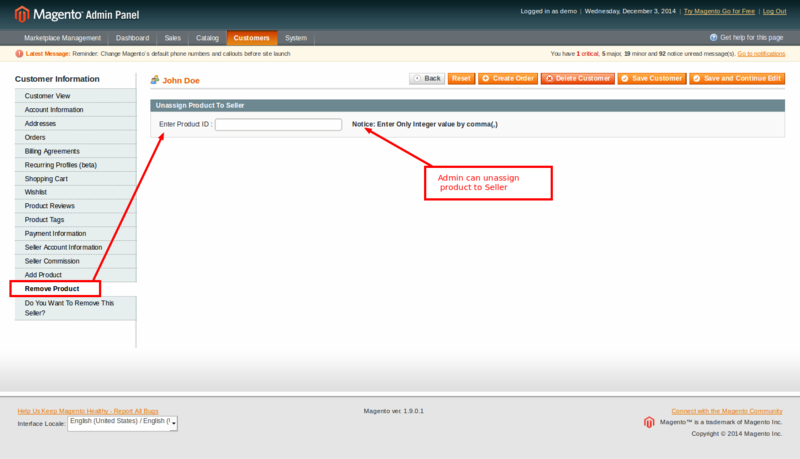 Here admin can enter the default value that will use when the seller has not set any product purchase limit. For example, if the admin has set default 3 product purchase quantity and the seller has not set any limit then the customer can only buy 3 product quantity. If the seller has set some product quantity limit then that limit will be used. If admin sets this option as “Yes”, then the seller info. will be visible under the Marketplace Dashboard menu on the product and the landing page. If this option is set to “No”, then the seller info. will be hidden from the Marketplace Dashboard, product, and the Marketplace landing page. If this option is set to “Yes”, then seller can change their profile page background color as per their need. When this option is set “Yes”, then the seller can change the URL to any name they want and then that new name will appear. The seller can change the URL of the Profile page, Review page, Collection page & Location page. Like this seller can manage the custom URL for their shop. The seller policies like return policy, shipping policy will be visible on the frontend if the “Seller Policies Enable at front end” option is set to “Yes” by the admin. Else the seller policies will not be visible if set as “No”. If the admin has selected “Yes” for this field then when a new customer creates a new account it automatically creates the seller public URL at the time of registration. If the admin has set this option as “No“, then the seller will have to manually add his rewrite URLs. 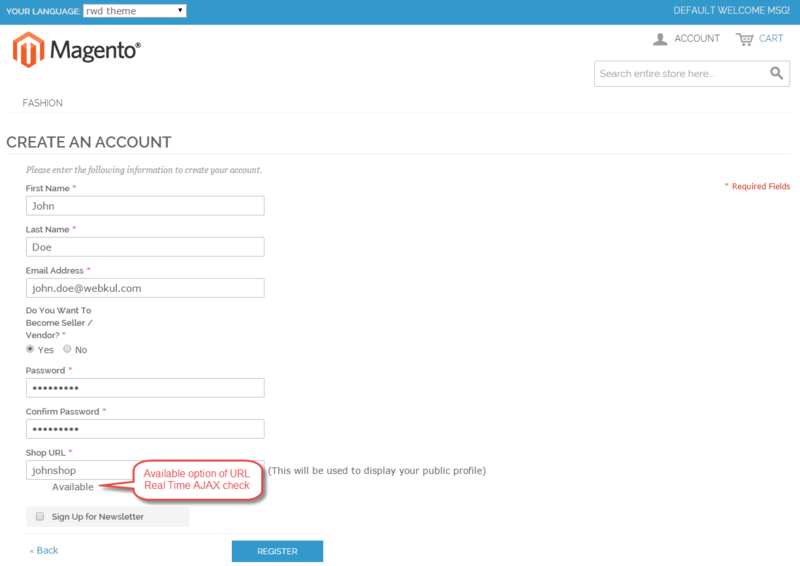 Here, the admin can Enable or Disable the Seller registration from Customer Registration Page. 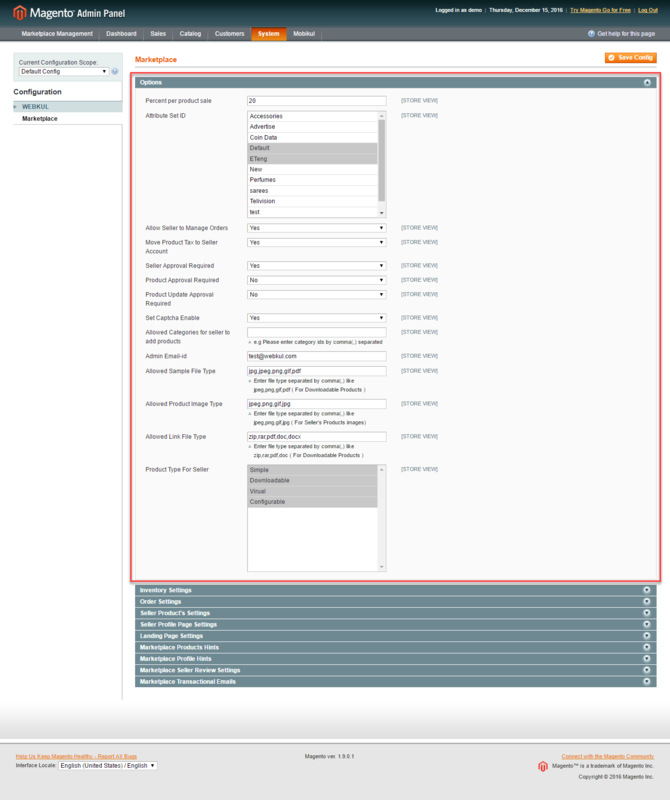 The admin can also choose any of the layouts among the 3 available layouts and customize them as per the need. From here admin can Enable/Disable the seller registration from the customer registration page by selecting either “Yes” or “No”. When selected ‘No’ and if Layout 2 or 3 is selected then it will work as a Seller Central. 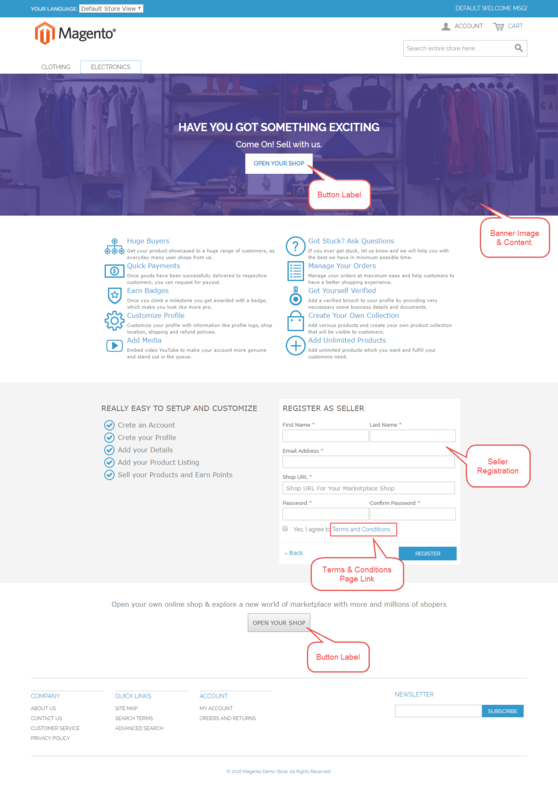 Here admin will enter the Head title of the Marketplace landing page and that name will appear on the front-end. 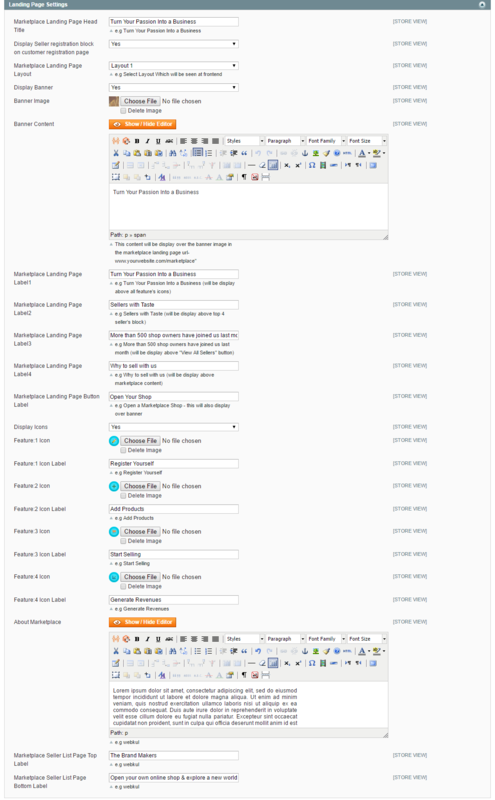 Here admin can choose from various layouts that will be shown on the front-end. 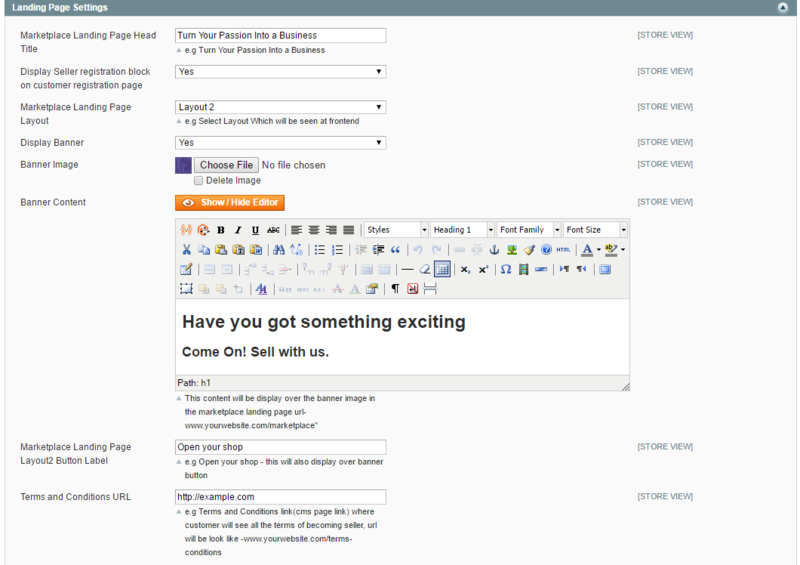 Here admin will enable the option “Display Banner” so that the banner will be displayed on the front-end. In “Banner Image” section, the admin will choose and upload the banner image. For the “Banner Content”, the admin will write the content which will be displayed over the banner image in the Marketplace. Here admin will enter some catchy lines and it will be displayed above all feature’s icons. Here admin will enter some content which will be displayed above top 4 seller blocks. Here, Admin will enter the content for displaying above “View All Seller” button. Here admin will enter the content for displaying above marketplace content. 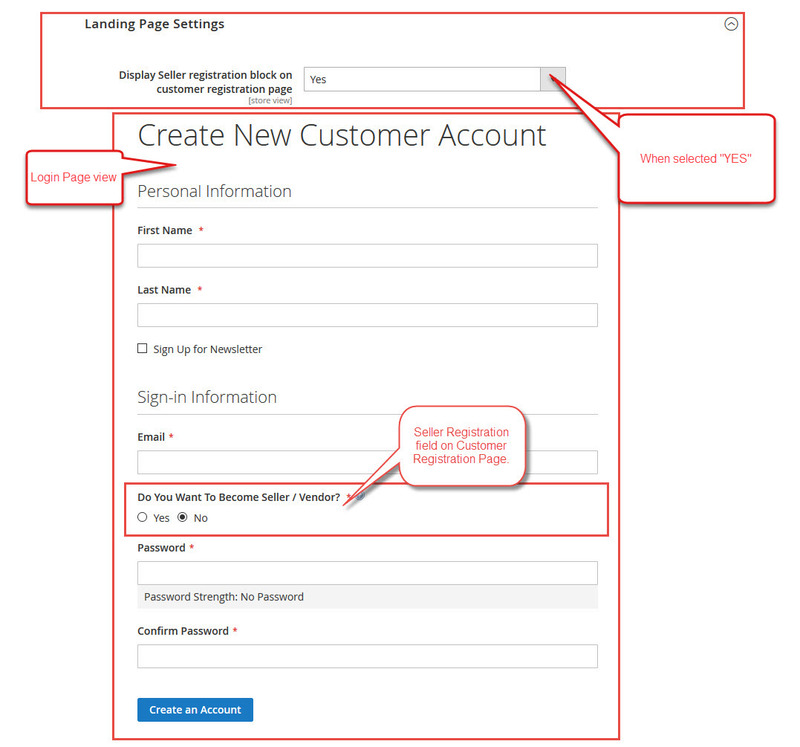 Here admin will enter the label for the landing page button label and it will get displayed on banners. Admin can set this as “Yes or No” and then anyone can see Feature icon and Feature label. Likewise, the admin will select for all the Feature icons 1,2,3,4 and Feature Label and it will be displayed as per the admin setting. Admin will explain the overall workflow of the Marketplace through the four icons as shown in the image below. Any Seller can register themselves in the Marketplace, then add products for their shops. After adding the products into their shops, selling will be done and then revenue will be generated for the sale. Here admin will enter the content inside the box provided. Here admin will enter the label which will be displayed at the top of the Marketplace Seller List Page. Here admin will enter the label which will be displayed at the bottom of the Marketplace Seller List Page. Here admin has to enter the Terms & Conditions Page link address. Admin can set this as “Yes or No” and then anyone can see Feature icon and Feature label. Likewise, the admin will select for all the Feature icons 1,2,3,4,5 and Feature Label and it will be displayed as per the admin setting. Admin will explain the overall workflow of the Marketplace through the five icons. Any Seller can register themselves in the Marketplace, they can customize their profile and add details, then add products for their shops. After adding the products into their shops, selling will be done and they will generate profit from sales. This field is responsible for Enable or Disable product hint for the product category, name, price, special price, quality, stock, tax, and image. 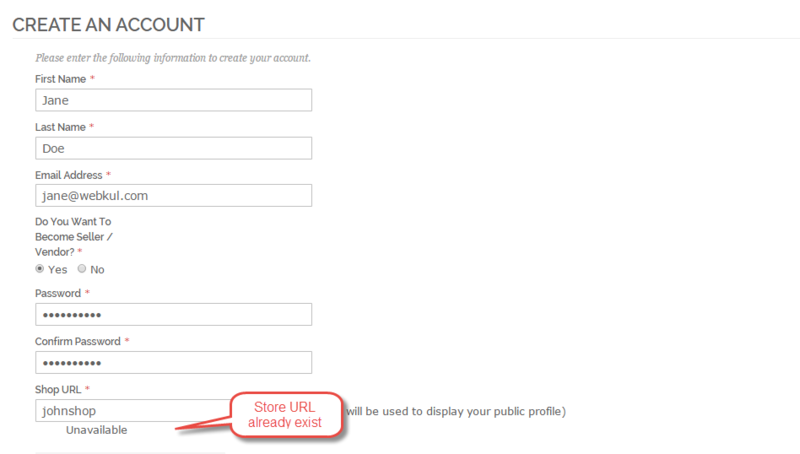 Using this field admin can Enable or Disable the profile hints including shop URL, profile id, and much more. When Marketplace Seller Review is set to “YES”, then the customer can make a review only after the purchase and if “NO” is selected then the customer can make a review before the product purchase. Now, the admin can select the custom templates from drop down list. 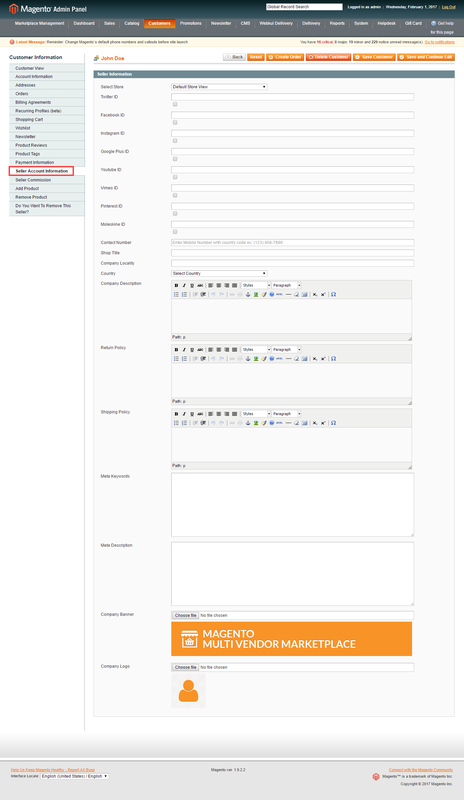 Created custom templates will be added in the drop down list and admin can use desired template. This module is based upon a responsive theme which makes the marketplace landing page more beautiful than before, incorporating an alluring banner with its content. The page is divided into 4 different labels, between the Banner Image and Footer links, showing icons like Registering Yourself, Adding products, Start Selling and for Generating Revenues. The second label will display the top 4 sellers of the marketplace, with their top three selling products, Seller logo, Shop Title, and a button to redirect to view the full collection of the seller.The label also contains the option to ‘view the list of all the sellers’ of the marketplace at one place. You can see there are four icons which display the overall working of the Marketplace in a gist. Any customer can register themselves in the Marketplace, then add products for their shops. After adding the products into their shop selling will be done and then revenue will be generated for the sale. After clicking on View All, you will redirect to a new page, where the customer can search seller by the shop and all the seller’s information will be there along with the seller’s logo. There will be a “View All” button which will display all the products of the seller. 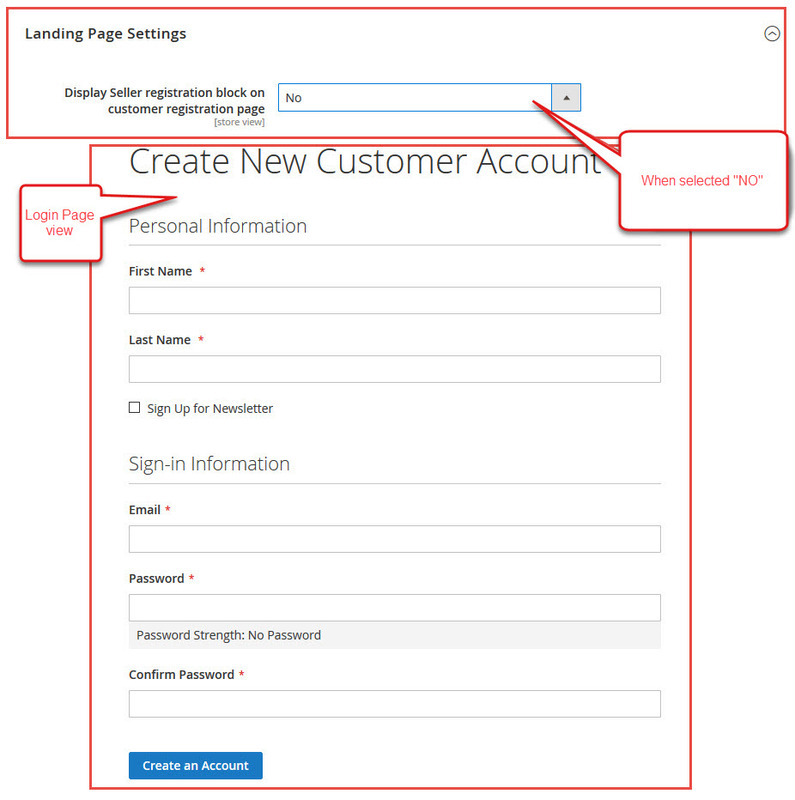 When Display Seller Registration Block on Customer Registration Page is selected as “Yes”, the seller can register from the customer registration page only. 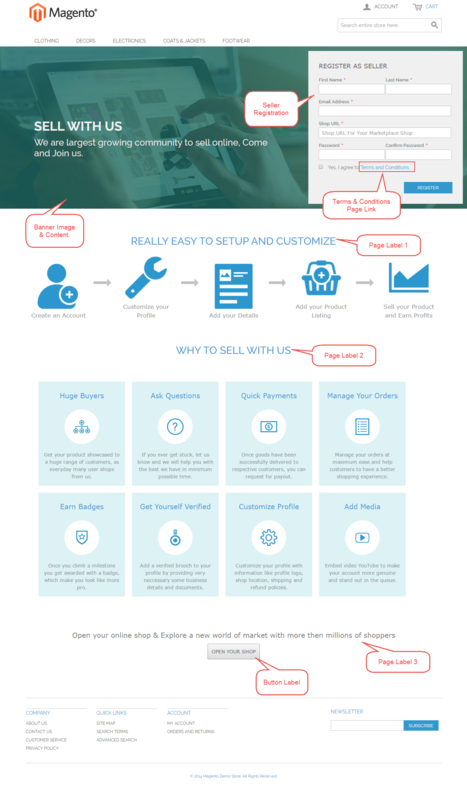 Seller signup is very easy, the user can signup for the seller using marketplace landing page button or from store My Account link and during signup, they need to choose “Do You Want To Become A Seller / Vendor?”. If they want to signup as a seller then they need to choose YES else NO. If they choose YES then they need to put their shop URL which will be unique as per the screenshot. The shop URL input field is Ajax driven by which seller can see that particular URL exist or not as below screens. As per the screen that URL does exist. As per the below image, that URL does not exist. When Display Seller Registration Block on Customer Registration Page is selected as ‘No’, the Customer will be able to register themselves using the separate registration page form for Sellers. 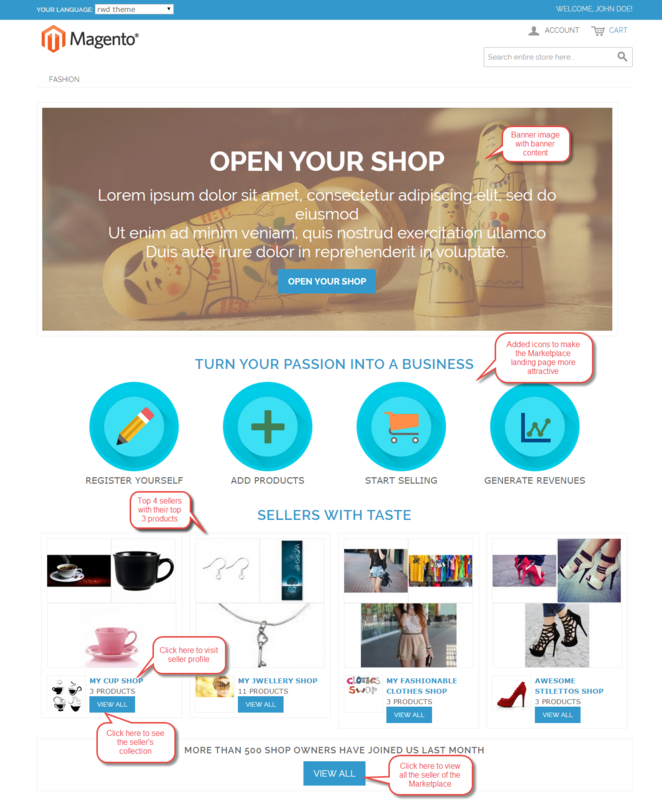 Landing Page Layout 2 & 3 will work as Seller Central. The seller can go to Account > Sell to visit seller registration page. If the user has been approved as a seller then, the Marketplace block will display in the Account section of the user as per the image. From here Sellers can edit their profile, add new products, delete their products, view their transaction list and order history. You can see there are many other links for base marketplace module to manage seller profile and to add the product to the store. Let’s proceed one by one. Using this menu seller have shop information like shop name, the location of their shop, banner image, shop logo, shop meta description metadata and many more parameters as per the below image screenshot. In the Seller profile panel, the seller can add his various social media links, contact number, Background color, Shop title, Company Banner, Company Logo, Policy details, etc. If there are multi-lingual stores then seller can provide different information for different store views. The company logo uploaded here on the seller profile page will be visible on the Invoice & Shipment slips as shown below in the snapshot. 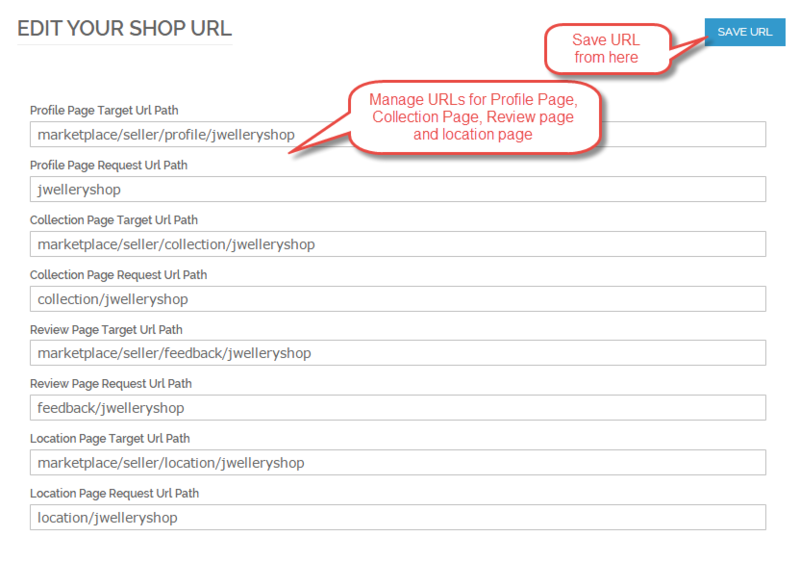 One can now edit the different Shop page’s URL as required for Profile Page, Collection Page, Review page & Location Page,then he can set accordingly, as shown in the screenshot, which will be displayed in the URL of the particular page requested. The seller can manage the custom URL for the shop. Payment details under payment details seller can add their bank account or paypal id or any other kind of payment information. 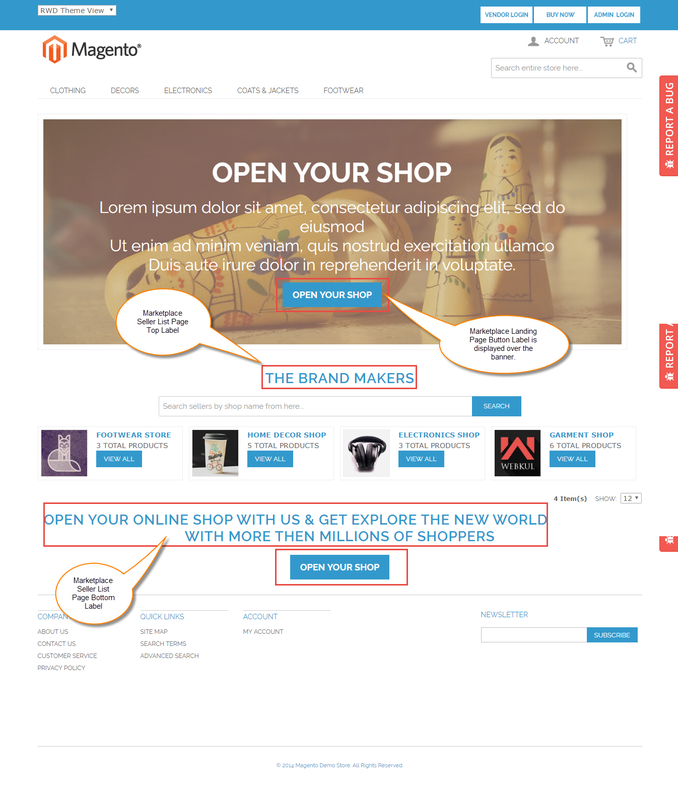 After entering all the information you will get an amazing page for your shop as below. In profile menu you can see Reviews by customers, Contact Us Information, Return policy and Shipping policy as set for the company. When user will click on View Full Collection, user will be able to see Seller’s Product Categories. From seller collection page buyer can add product to his cart and proceed for further process. 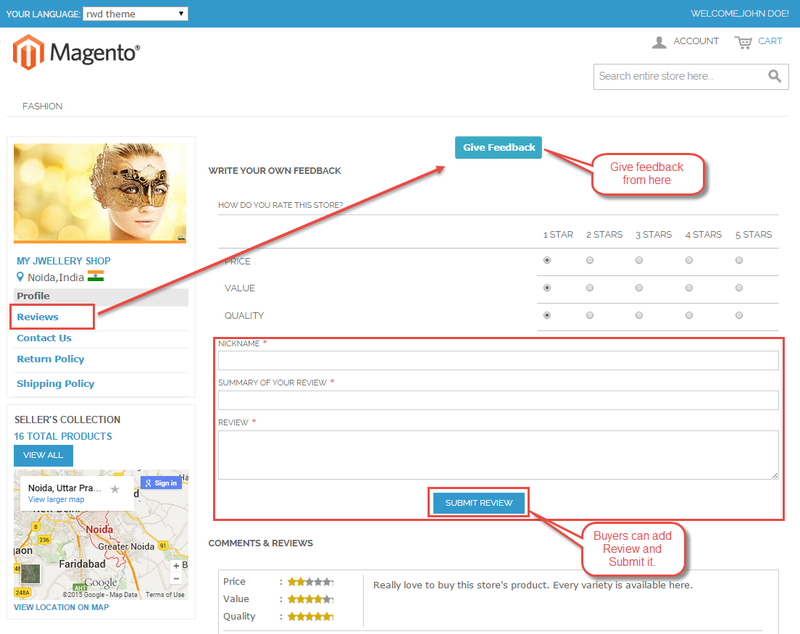 In the product page, the customer can view the reviews for the seller along with the shop link for that seller as shown in the below image. Buyer can rate the seller according to his/ her opinion under their profile with star rate vote and feedback message as shown below. From above screen, you can see user can put their review about seller, these reviews will be moderated by Store admin. Above two plugin does not come with marketplace base plugin, admin need to purchase both the add-ons to use them. After selecting Attribute Set and Product type new product page will be open, in which you have to enter whole information about the product and save it. If the admin has set only one “Attribute set” and one “Product type” then – in this case, the seller will be directly taken to the “add product page” without being prompted to select the Attribute Set and the Product Type for the new product. This will cut the selection of these two options for the sellers where the admin has set only one Attribute set and only one Product type for the sellers. If the admin has set more than one “Attribute Set” and “Product Type” then – in this case, the seller will have to first set the Attribute set and the Product type for the new product and then the seller will be taken to the Add New Product form page. If the admin has set only one “Attribute Set” and more than one “Product type” then – in this case, the seller will first have to set the Product Type for the new product and then the seller will be taken to the Add New Product form page. 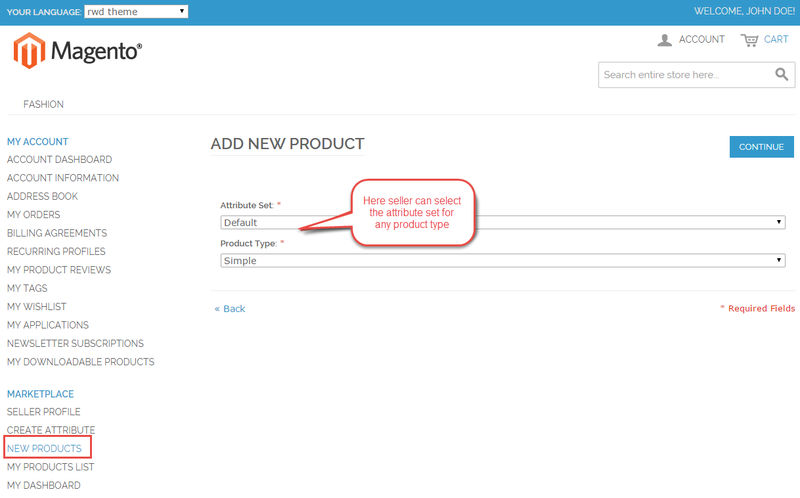 If the admin has set more than one “Attribute Set” and only one “Product type” then – in this case, the seller will first have to set the Attribute Set for the new product and then the seller will be taken to the Add New Product form page as per the below screenshot. Note-The seller cannot upload image from the WYSIWYG editor provided in the Description & Short Description text box in the Add Product page. Seller have to fill up all the details for adding the product. Seller can also duplicate an existing product. To create a duplicate product using an existing product, seller has to provide the SKU, Stock quantity and Stock Availability. Seller can also select the Related Products, Up-sells products and Cross-sells products if the admin has enabled this option. Seller can add Downloadable Product also using Magento Marketplace multi-vendor module. Software, e-books, images, music or video, or any type of content that can be packaged into files and downloaded can be added using this product type. Seller can also duplicate a configurable product they just to select the attributes and the product will be duplicated and then seller can add associated products for that duplicated product. Adding up a downloadable product will create an additional field to enter the URL or upload File, as mentioned in screenshot. Seller can add Virtual Product which do not have physical presence. Seller have an option for configurable product as well. Seller can add Configurable product as shown below. You must create attribute for Configurable products. You need to create attribute for Configurable Products including attribute set, group, code, label and more. 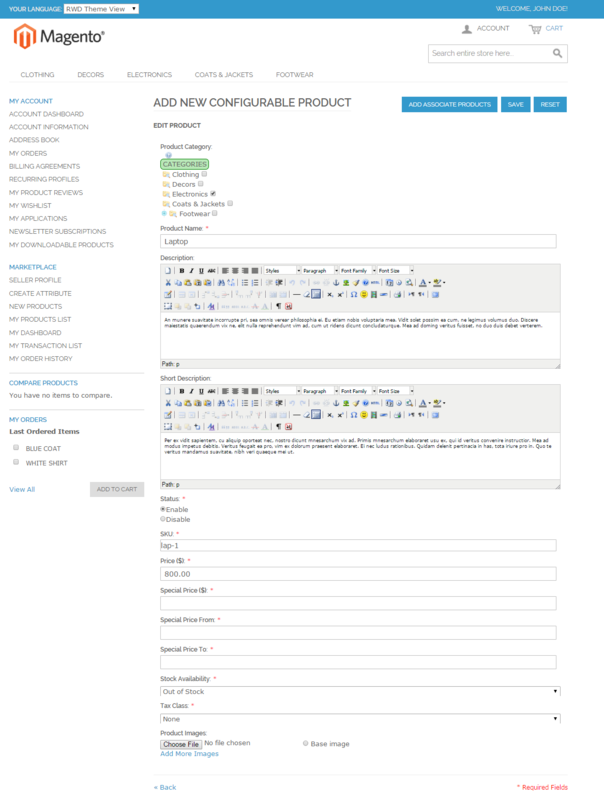 Here you will select the configurable attributes for which combination of associated product will be created. Now enter all the fields value to create a configurable product. After adding Configurable product page, seller will edit that particular product and then seller can see the option for adding “Associated product” for the same product. After successful addition of the Associated product, that product will appear on the product list as a Simple Product. When the seller will click on the “View” button, then seller will be re-directed to the page where seller can edit or delete that associated product. Using this menu seller can manage their product like they can edit their product, delete their product, track their product sales and can manage their stock as per the screenshot. There is a delete option “Delete Products” by which seller can delete selected products. Filters are also available by which products can be filtered according to Product Name, Date and product approval status. You can see this as below screenshot. Quantity Confirmed denotes that the order has been completed. Quantity Pending status shows that order is not completed yet. Quantity sold denotes that buyer have placed orders whether it is confirmed or not. Using seller Dashboard seller can track his income, latest order, comment and reviews, recent orders and recent comments with total sales matrix. Seller can also track Total Payout and Remaining Amount from My Dashboard. If Seller have any doubts or query then they can ask from the admin by click-in on the “Ask Question To Admin” button provided on their dashboard. The communication here is via emails and there will be no record of this communication in the back end. This is a way of communication between Seller and Admin. Seller can see their Transaction in this field. Seller can also filter the transaction using Transaction id, Date and view whole transaction details. The sellers of the Marketplace can manage shipping from their end and can generate invoice and shipping labels when you have installed any of the Magento Marketplace Shipping Modules. Here the sellers can save their Invoice and Packaging/VAT/TAX Information that will be visible on the Invoice and Shipping labels as shown below in the snapshot. 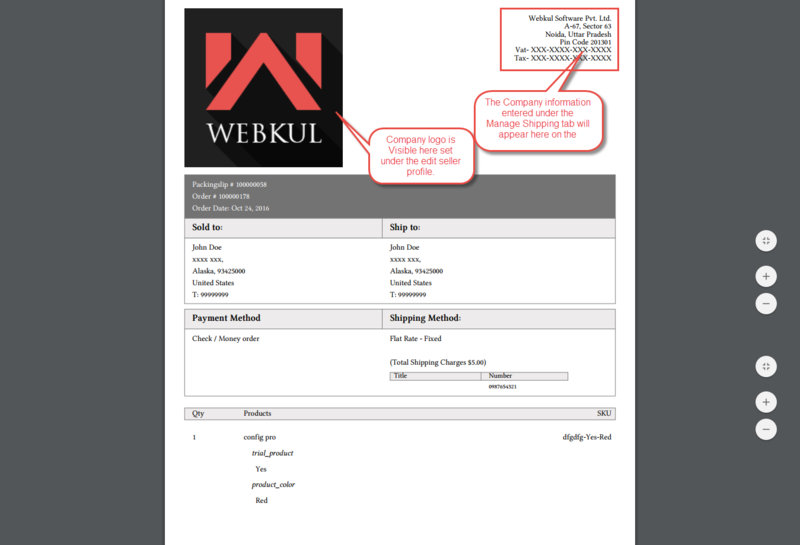 The company logo can be uploaded under the seller edit profile and will be visible on the Invoice and Shipping slip as shown below in the snapshot. 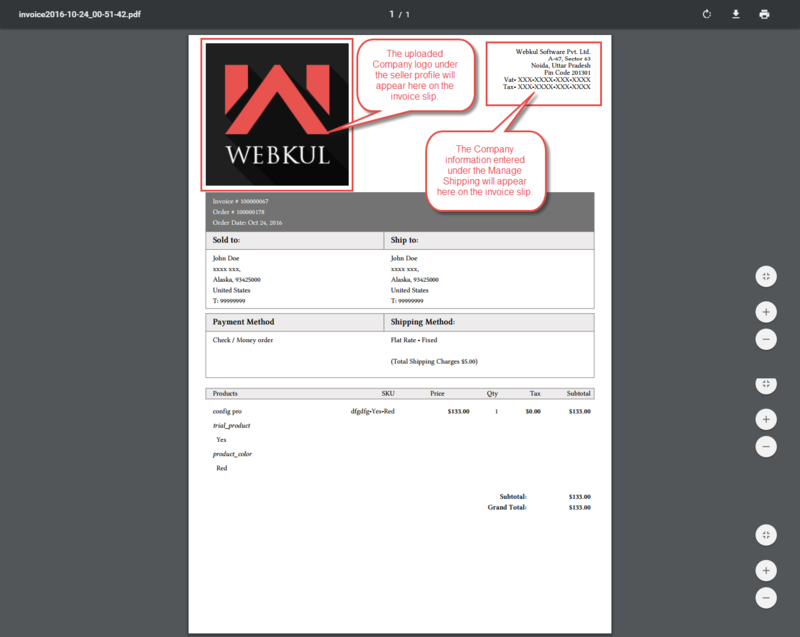 The information entered above for the company logo and the Invoice and Packaging Slip/Address/VAT/TAX/Information will be visible on the Invoice and Shipping slips as shown below in the snapshot. Using this field seller can see order history of their product. 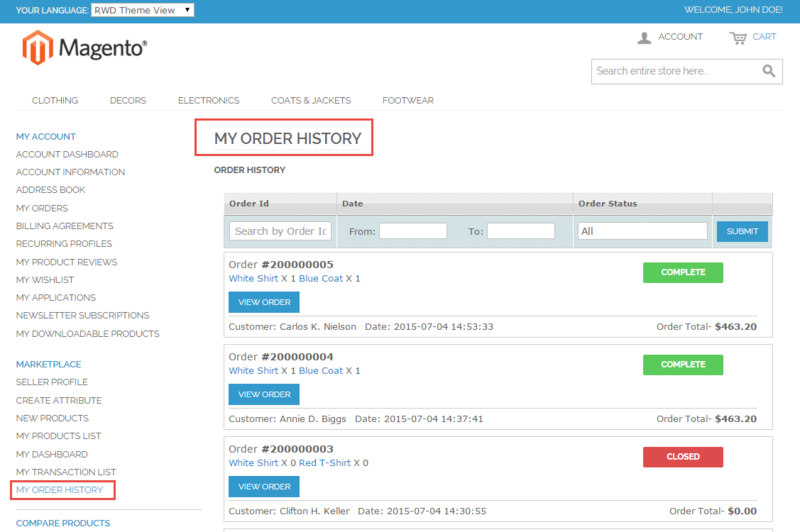 Order histories can be filtered by Order Id, Date and order status. 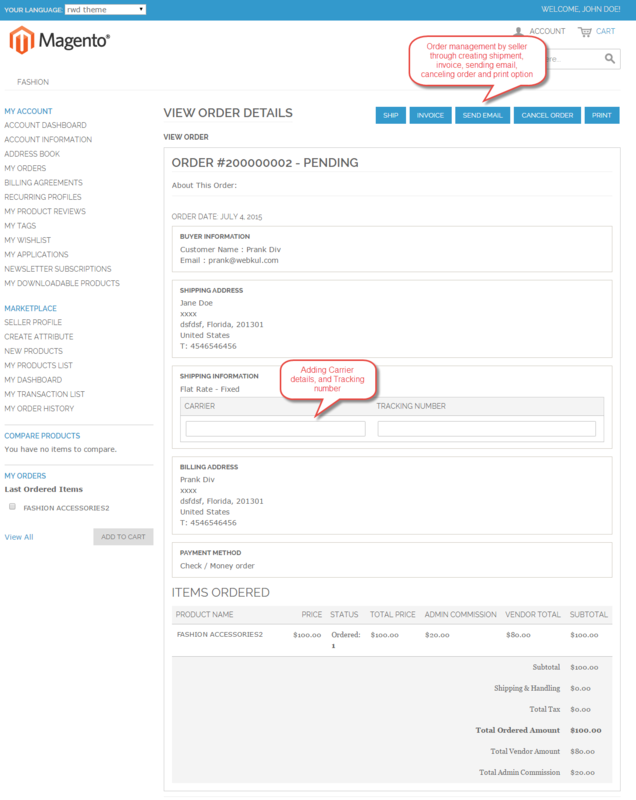 After clicking on View Order, Order Details will display with Buyer information, Shipping address, shipping method, Billing address, Payment method, Items ordered as shown below along with that, a seller can manage shipment, add tracking number, creation of credit memo, sending emails, printing of invoices etc. Just by viewing order in ‘My order history’. 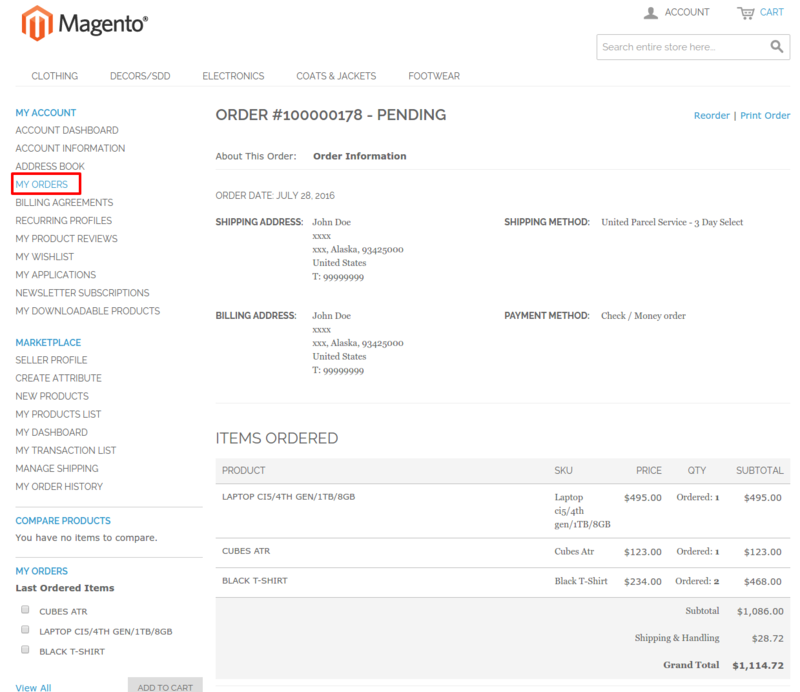 In the magento marketplace module, if an order is placed and it’s invoice has been created then seller will receive product sold notification mail with their product details. For an example, if an order is placed with three products (A,B,C) of Seller (x,y,z) respectively. So when order invoice will be created then sellers (X,Y,Z) will receive an email for their products (A,B,C respectively) with order details. After the successful set up of the marketplace module admin will be able to see “Marketplace Management” as per the below screen. This menu is responsible for managing Seller’s Product from Marketplace configuration panel (System> Configuration) product approval is required then in this case every product added by seller need to be approved by admin. Product approval will happen from Manage Product menu as per the screenshot. There is also a Deny option by which admin can deny the Seller’s product for a valid reason. 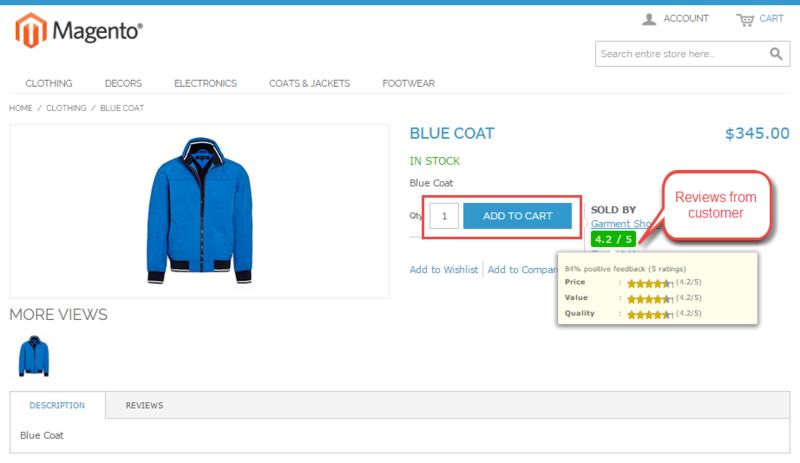 As you can see there is a prev button which will show the preview screen for product added by seller as per the image. This is an option by which admin can Deny the product. This menu is responsible for Seller Management from marketplace configuration panel (System>Configuration). If partner approval is required then in this case every seller need to be approved by admin as per the image. There is an option by which admin can Deny the Seller. To pay the seller, the admin will go to Marketplace Management->Manage Sellers. And from the list of sellers, you can select the seller by clicking on the “Order” link. 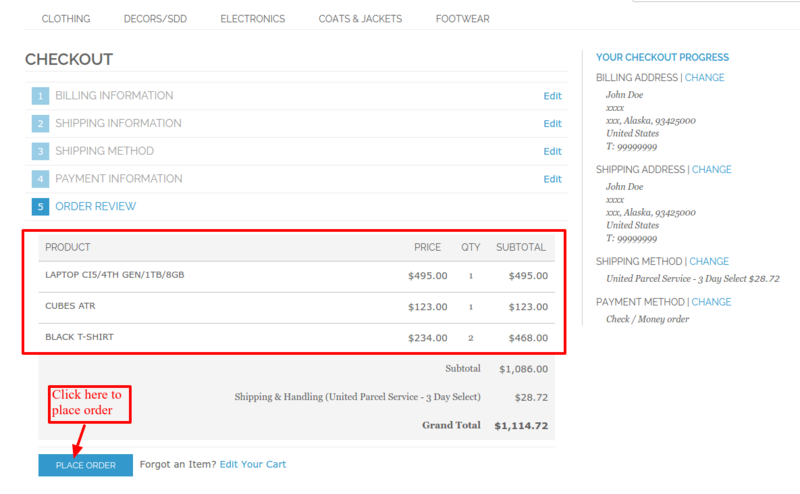 After that, you will be redirected to the “Manage Seller’s Orders” page and can see the complete orders of that seller. The admin will pay only for those order whose order status is “Complete” and Paid status is “Pending” as shown in the below image. Also, the “Pay Seller” button will get enabled only for those orders whose order status is “Complete” and Paid status is “Pending”. However, the amount displayed against the “Total Amount To Be Pay” under Seller Payment Information will be calculated only for those orders whose order status is “Complete” and Paid status is “Pending”. Then you can click the “Pay Seller “Button and a pop-up will appear where you can add a comment and click pay to pay the outstanding amount to the seller. The product name field will display the order details relating to the specific product like the products ordered, invoiced, shipped & refunded. The Quantity to be paid field shows the amount for the particular quantity on which amount is still to be made. Also under view column admin can see the order of the seller including Account Information, Billing Address, and Shipping address and many more. Manage commission menu is responsible for all the commission management despite of global commission. There is an individual seller commission by which admin can set different commission for different sellers. Admin can Manage the Customer under Customer > Manage Customer. 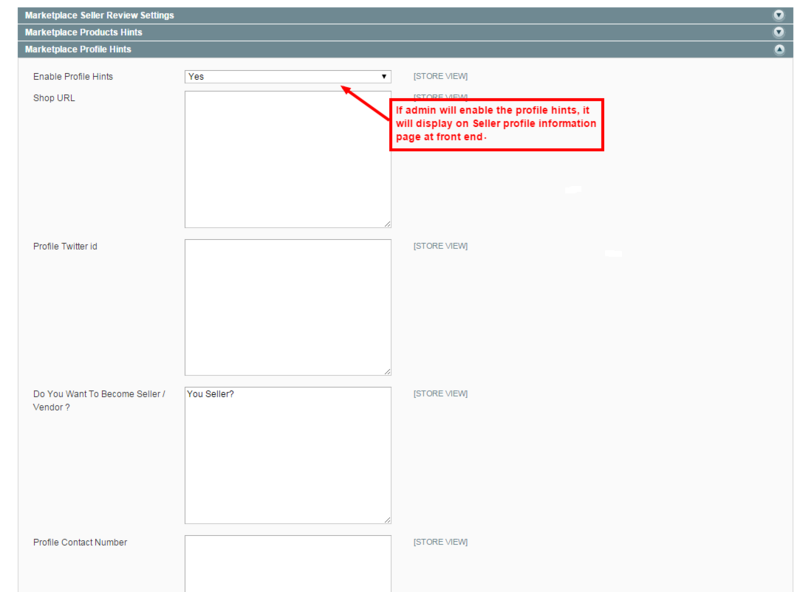 In Manage Customer section admin can edit the Customer information. Under Edit action this page will be open and from here Admin can perform following action. Payment information is payment details entered by a Seller during account creation under Customer> Manage Customers> Edit. This payment details will be used by admin to pay the sellers. 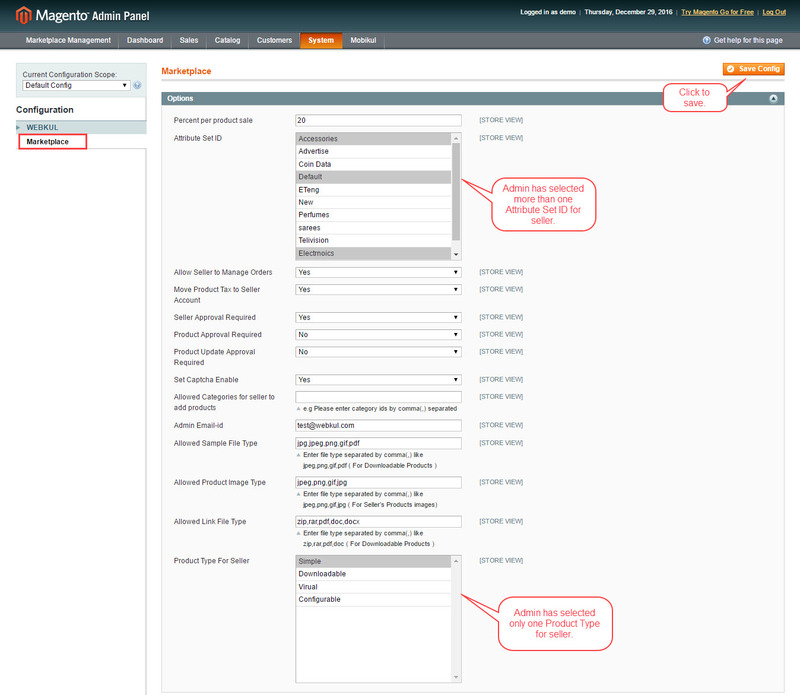 Admin can View and change the Seller account information of different stores using this field. This field will also help to Create new order and delete customer through admin. Admin can set the commission in percentage for particular seller. To set the commission navigate to Customer > Manage Customers > Seller Commission. 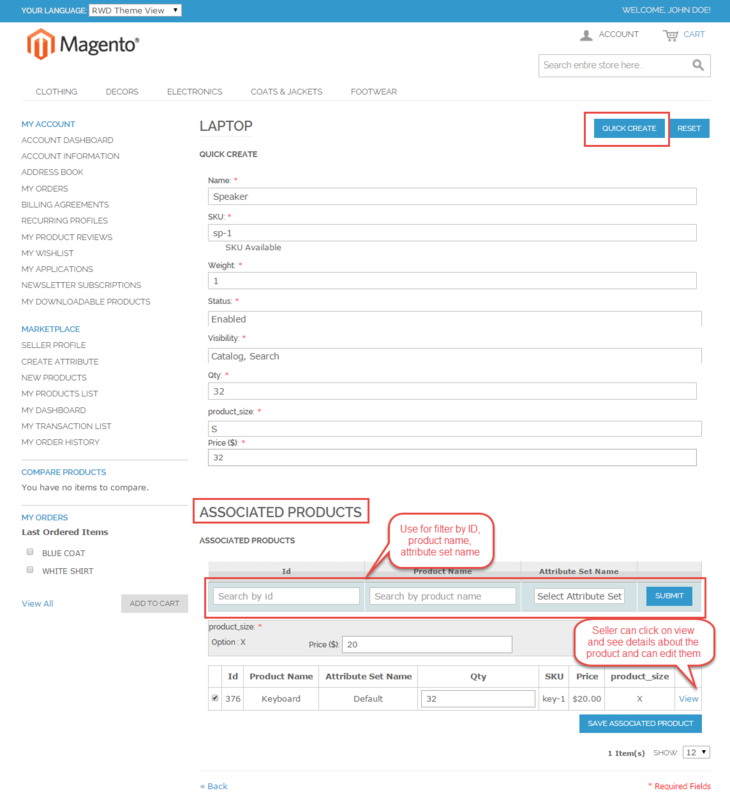 Admin can add and assign product to any seller by navigating through Manage Sellers, then Select the customer and under menu “Customer Information” select “Add Product” menu item. Admin need to enter the “Product ID” that is associated with the product in the “Product ID “field and click save after that to assign product to the particular seller. Admin will navigate through Manage Sellers, select the customer for whom he wants to unassign the product and then from the menu “Customer Information” select the “Remove Product” menu item. 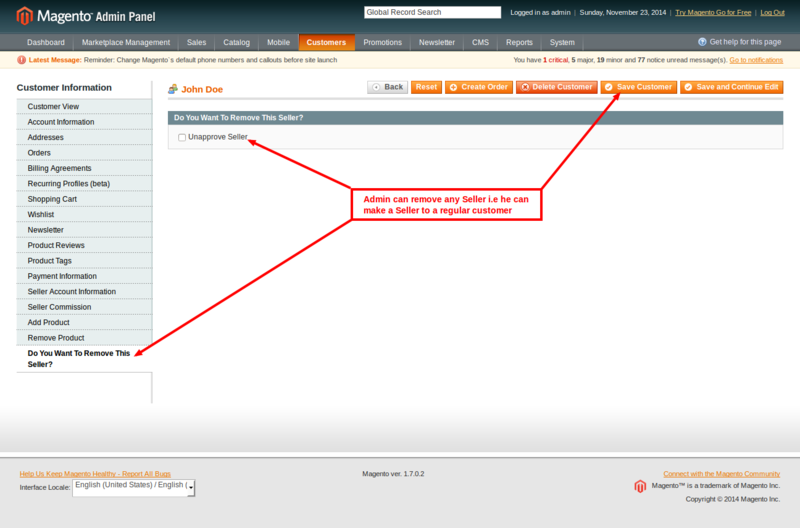 Admin will provide the “Product Id” of the product to be removed and will click “Save Customer” to save the settings. Using this field admin can remove any seller from the Marketplace and make him a normal customer. This menu is responsible for all the reviews. Admin can approve, unapproved, and delete the reviews. Unapproved or deleted reviews will not appear in Seller’s account. Admin can also see the ratings for price, value and quality in terms of star. 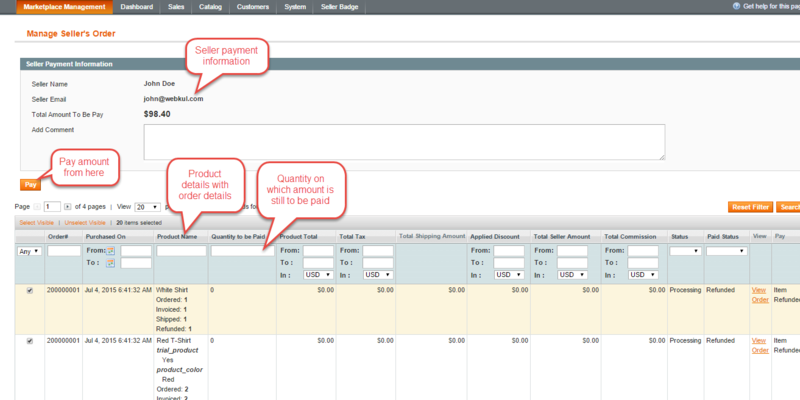 A customer can add products of multiple sellers in the cart and process checkout. Now the customer can see the order under the order history page like this. where is the change log? there two field is missing is a Display Seller registration block on customer registration page and Marketplace Landing Page Layout. How to shown this field in my admin? Please make sure that you are using the latest version of the module. To confirm you can contact us at support@webkul.com and we will assist you further. The current version of Marketplace module is 1.0.7, please send an email to support@webkul.com and our team will assist you regarding module update. Is it possible to sort by newest product first for each shop? 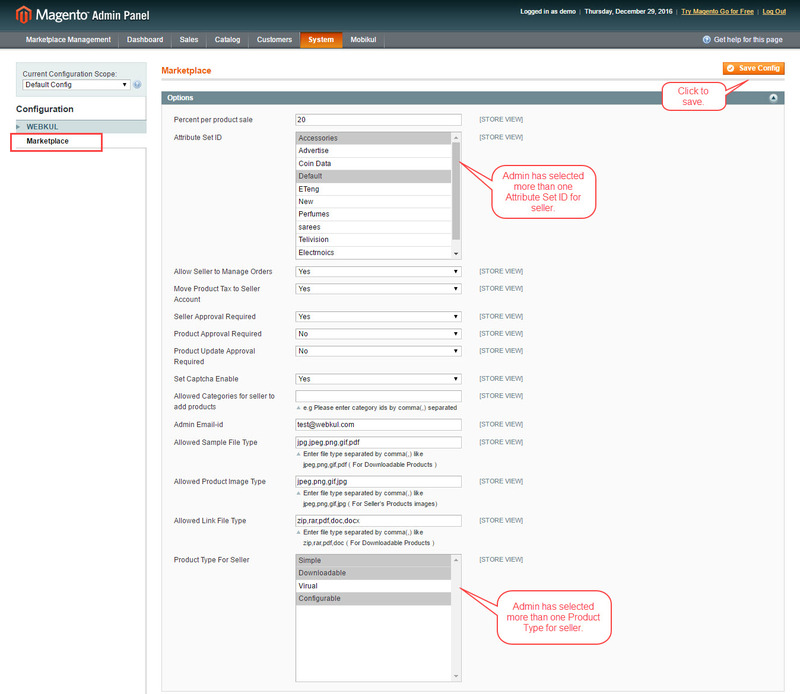 is there a way to do user roles and access controls for multiple users in our magento Admin panel? I have patched my magento 1.9.1.0 with work with php 7. Would like to know if the marketplace module is compatible with php 7 as well? Yes it will work with PHP7 as well . my marketplace emails such as ‘seller request to admin to open shop’ are not being received on my official email (powered by google apps), however If i use my personal gmail, it is being received, any help? 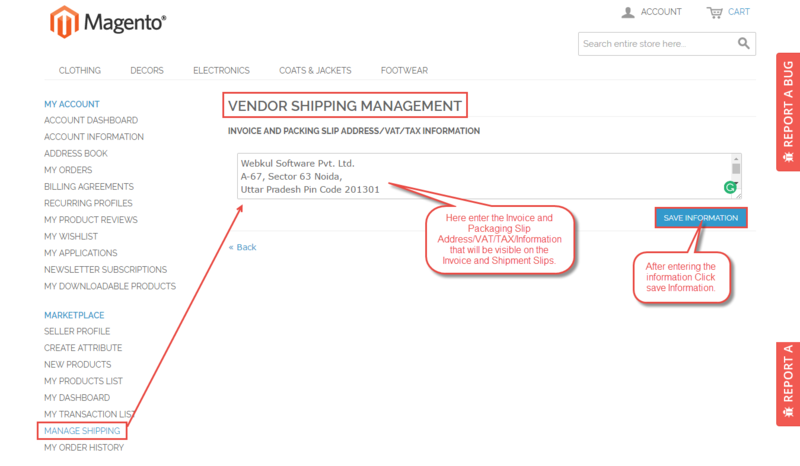 Hello Angad, Please report this issue at support@webkul.com and provide essential details like FTP details, Magento Admin details and the order id of the purchased module. Our development team will check the email related issue asap. However since this transaction was already ‘successfully completed’ and payment released to seller already (by previously clicking the PAY button), should this ‘0’ number, instead be a negative value to the extent of the refund amount so total payable can be adjusted to account for this refund amount against future transactions?